Question: It's too easy to miss the email when a filing is rejected or an eservice failed to be delivered. Isn't there something you can do to give us better warning? Answer: Yes, that is why we developed the FileTime Alerts Manager. It warns you when you have a: (1) failed filing, (2) filing returned for correction, (3) failed eService, or (4) a failed Fax Service. After logging into FileTime you are on the Case Overviews page by default (Figure 1). If the Alerts button is flashing (Figure 1, A) you know that you have an alert of some kind. FileTime takes you to the Alerts Manager page (Figure 2). Any unopened Alerts are displayed in red. Any Alerts you, or someone else has viewed are displayed in gray text. Click the Resubmit button (Figure 2, B) for Returned for Correction filings to preserve the initial submission date. 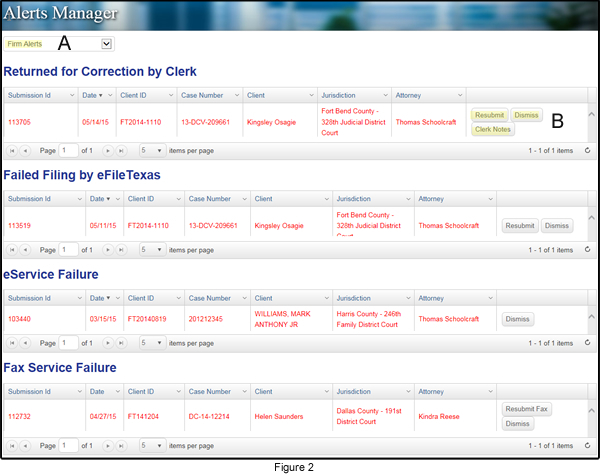 Click the Clerk Notes button for Returned for Correction filing to view the reason the clerk gave for the return. (Figure 2, B). Click the Dismiss button (Figure 2, B) to delete an Alert from this page.